Search engine optimization (SEO) is an ongoing activity and many business owners use outside agencies to help get these kinds of results. I am fortunate to have spent the last decade in digital marketing before launching First Impressions Video. SEO is also very fluid and tomorrow my rankings can change–good or bad. But after working at this for quite a while, it’s nice to see Google “smiling at my website” today! 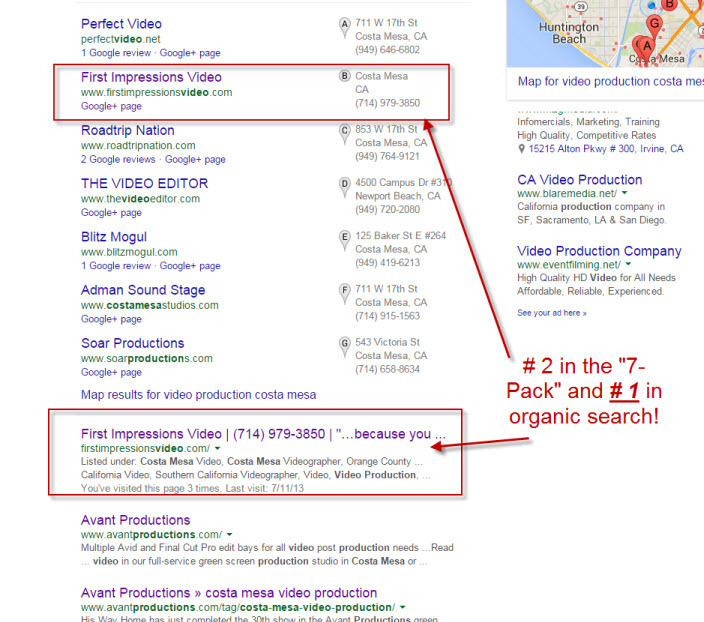 Full disclosure: there were three listings that preceded First Impressions Video in the search results, but one was a generic Yelp listing with no specific company cited; the second was for Costa Mesa Television, which is not a video production business and the third was a directory page of the “top 15 video production services in Costa Mesa.” None of those was a stand-alone business.